Building reliable, scalable infrastructure in the cloud to meet QoS requirements. 6Connex designs innovative marketing, sales, recruitment, training, and HR communications tools to help businesses transform big ideas into real-world results. The company’s software platform offers a fully customizable, secure and reliable solution for a variety of applications including virtual events, and environments for career fairs, employee onboarding, user conferences, and corporate universities. Inability to meet customers’ demands for reliability and quality of service. Limited ability to scale up and down based on the size of virtual events, impacting profitability. To address these issues, 6Connex started looking for a solution that would enable them to redesign their infrastructure for better performance. Given the nature of their business, zero downtime of production environments was a central requirement, as their key promise to clients was reliability and quality of service related to virtual events. Their new infrastructure also needed to have the ability to scale up and down, as required, to maximize profitability. 6Connex wanted to deliver new functionality in its online service to clients throughout the implementation of the new infrastructure. To achieve this goal, their senior management and technical teams collaborated with nClouds, a Premier Consulting Partner in the AWS Partner Network (APN), to implement a continuous delivery process and deployment pipeline using Jenkins and Chef. This allows for robust testing, continuous delivery of new features, and ensures the long-term effectiveness of the environment. 6Connex uses AWS CloudFormation as a provisioning and management tool to ensure predictability and continuity. This gives the 6Connex team the ability to quickly scale up and down while reducing resource usage costs. nClouds provides 24/7/365 support for the 6Connex infrastructure as well as ongoing technical management and guidance as the business continues to grow. AWS CloudFormation - Enables the 6Connex team to run infrastructure as code and deploy AWS services in multiple configurations. 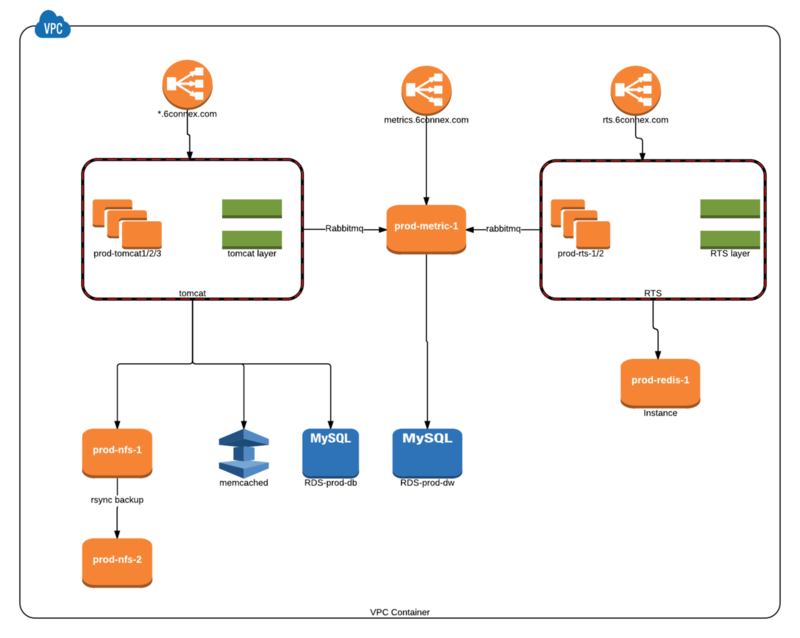 Amazon ElastiCache (Memcached) - A web service for setting up, managing, and scaling cache environments in the cloud. Amazon S3 - An object storage for storing and retrieving data from 6Connex applications. Amazon RDS (MySQL) - A relational database service for setting up, operating, and scaling MySQL relational databases in the cloud. Route53 - A highly available and scalable DNS cloud service for handling domain registration and routing users’ Internet requests to 6Connex applications. Amazon CloudFront - A web service that speeds up distribution of static and dynamic web content to 6Connex users. Amazon VPC - Enables the 6Connex team to launch AWS resources into a virtual network. Elastic Load Balancing - Automatically distributes incoming application traffic across Amazon EC2 instances, containers, and IP addresses. Jenkins - An open source automation server used to build automated deployment pipelines. Icinga - An open source computer system and network monitoring application. Nginx - A high-performance HTTP server and reverse proxy, and IMAP/POP3 proxy server. Apache Tomcat - An application server that executes Java servlets and renders Java Server Page pages. ActiveMQ - A powerful open source messaging and Integration Patterns server. NFS - A client/server application for viewing and updating files on a remote computer. Redis - An in-memory data structure store, used as a database, cache and message broker. The new design provides continuous integration capabilities and gives developers the ability to deploy easily without concerns for infrastructure stability or services availability — with the added benefit to scale up and down on demand to reduce costs. The solution helps 6Connex deliver increased uptime and stability of their application with a self-healing infrastructure and provides the ability to recover from any outages quickly and efficiently. 6Connex now has an infrastructure that can scale up and down within minutes instead of hours. 6Connex’s current cloud infrastructure costs are a fraction of their previous on-premises costs. Building their new platform on a cloud-based, modern infrastructure with AWS improved performance, reliability and overall quality of service. Leveraging services like RDS and ElastiCache reduced operational tasks such as backing up and setting up read replicas, giving the 6Connex team more time to focus on delivering business value to their customers.